Hard to believe it's the final day of 2012. It's been a crazy year that has gone faster than all the years before that. I know, that's just part of getting older, but time really seems to go faster when you have an ever growing list of things to worry about. Now I haven't tried this before, but I think we need to count down the top ten posts of 2012. This isn't necessarily my top ten favorite products of 2012, but I will admit that #1 is near and dear to my heart gut. If you want, take a second to think of a few things that might be on the list... ok, ready? let's go! Blue Bunny dished up a few new additions to the Duff Goldman inspired lineup which helped give Blue Bunny their only appearance on the list but please do not sell them short by any means. They always have lots of new stuff every year so I expect great things as always in 2013. The Blizzard of the month tends to be a pretty popular post, but curiosity about the Confetti Cake Blizzard that takes top prize this year. I'm actually pretty happy to see the new York Peppermint Pattie ice cream treats come in at #6. It's a great treat that makes a nice addition to your current freezer selection. The Greek froyo craze exploded this year and while I'm not really a convert yet, I would love to see Ben & Jerry's get a little more fun and creative with this lineup in 2013. The oddball Rocky Road-ish was actually found during the first few days of 2012. You may not love it, but you have to appreciate the creativity here. The mighty Choco Taco got two new brothers this year, the fun Chocolate version and the hard to find Peanut Butter variety. Now if only they could give us a crunchy shell guarantee. Wow, despite new treats from BK and MickeyD's, Wendy's is the only one to break into our countdown. Who knew so many people would be amused by my almost puking on the drive home? Fun Times! 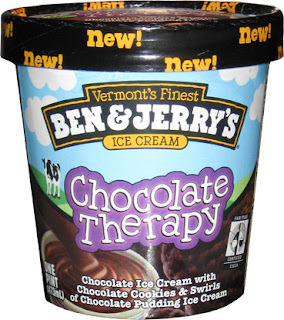 I can't lie, a pint of Chocolate Therapy is a mighty edition to the Ben & Jerry's lineup. If you haven't tried it yet, there's still a few hours to get it in before the year is done. Ok, thanks for sticking with the blog this year. I like to think we've had a lot of fun and hopefully we'll take things up a notch in 2013. Alright, go have some fun, and be safe, I expect to see you all back here tomorrow.